The Death Adder is temporarily out of stock. 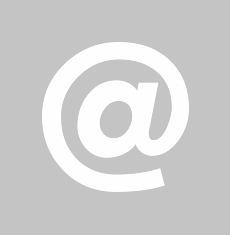 Order today and Phantom48 will normally ship in about 15-30 business days. The Death Adder™ is truly a metal monster. It's not subtle, it's not apologetic, it just kills. Classic thrash metal, death metal and even stoner metal all can be had with the Death Adder™. Designed to have a massive amount of gain, the Death Adder™ can be used in front of a completely clean amp or can be backed off to enhance an already crunchy amp for tight rhythm and solos. 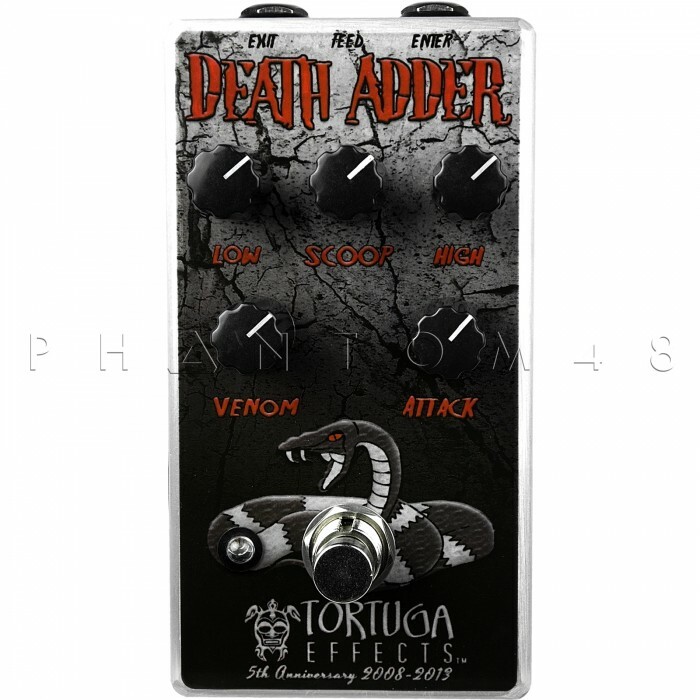 Unlike some metal pedals, the Death Adder™ actually has a very present midrange that can even be boosted to cut through for solo tones. Yet, if you want that classic scooped Metallica tone, the "Scoop" knob will make you forget there was such a thing as mids. The Death Adder™ works perfectly with humbuckers and drop-tuned guitars for more modern metal tones and stays articulate and clear no matter how fast you play. 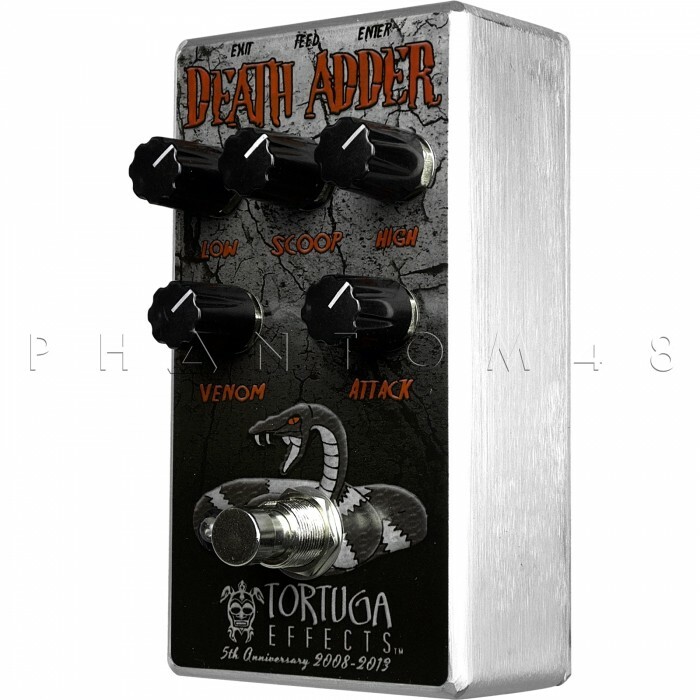 The Death Adder's™ "Venom" volume knob works as an overall volume for your tone. 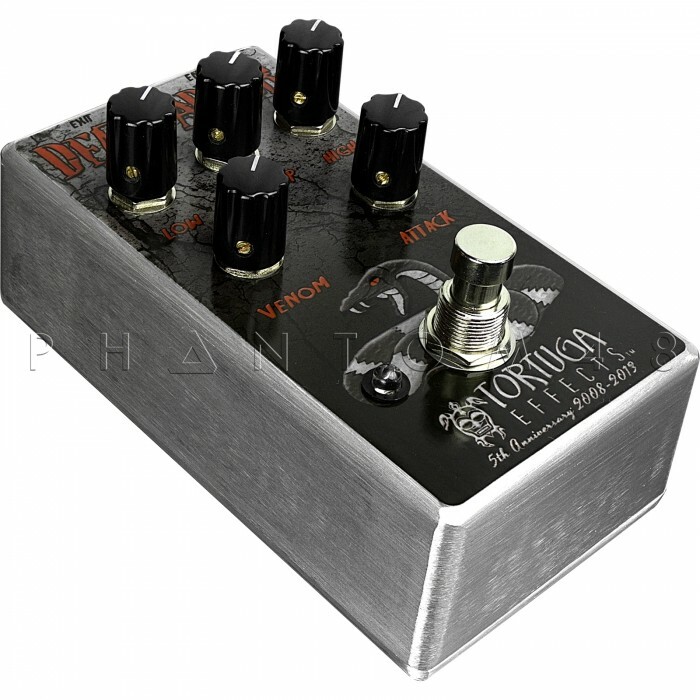 This way, if you have a small tube amp that just doesn't get quiet in a small room, you can back the "Venom" off and get a practice level metal distortion that won't wake the kids without losing your tone. With the Death Adder™ you can turn any amp into the ultimate, low volume, metal practice amp.